School Clerk In Georgia Persuaded Gunman To Lay Down Weapons : The Two-Way "I'm not the hero. I was terrified," says Antoinette Tuff. A gunman had walked into an elementary school near Atlanta with an assault rifle and other weapons. Tuff says she spent about an hour with him, telling him about her life. Eventually, he put down his guns and surrendered. 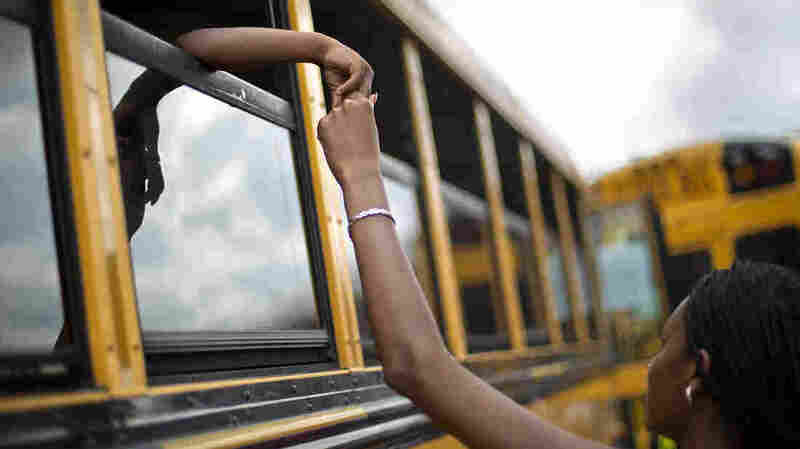 Laterrica Luther holds the hand of her 6-year-old nephew, Jaden Culpepper, as students from the Ronald E. McNair Discovery Learning Academy arrive on buses to waiting loved ones in a Walmart parking lot in Decatur, Ga., on Tuesday. A gunman had entered the students' school earlier in the day. No one was hurt. Tuesday's terrifying incident at an elementary school near Atlanta — in which a gunman with an assault rifle and other weapons entered the building — ended with no one being hurt after a school clerk apparently spent about an hour talking to the young man. She says she persuaded him to put down his gun and surrender. "I just started praying for him," Antoinette Tuff tells Atlanta's Channel 2 Action News. "I just started talking to him ... and let him know what was going on with me and that it would be OK. And then [I] let him know that he could just give himself up. ... I told him to put [the guns] on the table, empty his pockets. He had me actually get on the intercom and tell everybody he was sorry, too. But I told them, 'He was sorry, but do not come out of their rooms.' ... I give it all to God, I'm not the hero. I was terrified." "The school clerk said she tried to keep the assailant calm by asking him his name but, she said, at first he wouldn't tell it to her. Then, he began listening to her tell her life story. She said she told him about how her marriage fell apart after 33 years and the 'roller coaster' of opening her own business." Tuff says she told 20-year-old Michael Brandon Hill that "OK, we all have situations in our lives. I went through a tragedy myself." Then, ABC writes, "Tuff made the request that she said helped end the standoff. She said she asked the suspect to put his weapons down, empty his pockets and backpack and lay on the floor. 'I told the police he was giving himself up. I just talked him through it,' she said." During the incident, the 870 or so pre-kindergarten to fifth-graders at the Ronald E. McNair Discovery Learning Academy in Decatur were safely evacuated. At one point, the gunman exchanged some shots with police. But no one was struck.